Working with a vast array of media, it seems that nothing is off limits in their quest for inclusion, their works cover installation, sculpture, film, and photography. (Matthew Marks Gallery, Undated) Their work has been so varied in medium and subject that a real exploration of their work would be far longer than this short introduction to the pair. Their work seems to capture a childlike sense of discovery and the aim to pass this onto the viewer, encouraging them to take another look at their surroundings. Their work, while aesthetically chaotic, offers a meditation on daily life, in particular, our perceptions of it. By purposefully misusing objects and materials, they reference and reject the common usage and ask us to question it as well. Working with the idea of duality (Guggenheim, 2016) (in more ways than the act of collaboration) their work invokes understood opposites found in modern culture – Labor and leisure, beauty and kitsch, the banal and the sublime, ad infinitum. They challenge the divisions between these ‘opposites’ and uncover the falsity of our learned belief system. Their work aims to confuse, question and identify. The objects collaborate with each other; the process is one of collaboration between the artists as well as an overlapping production of artworks that ‘collaborate’ (or at the very least inform) one another. A practice of conversation. For the opening of the Tate Modern in 2000, they produced near perfect copies of workshop debris, ‘Untitled’. 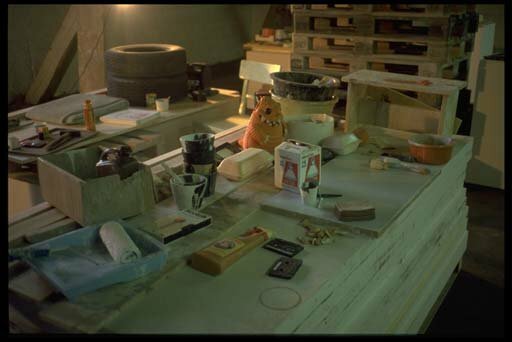 (Tate, 2006) The work is composed of objects commonly found in artists studios, arranged in a way that resembles a workshop, yet each piece has been meticulously recreated. These illusionistic objects reference their subject but remain separate from it. The objects pretend to be their subject, and that realisation, on the part of the viewer, is an integral part of the work for me. Fischli and Weiss (1993-2006) Untitled (Tate). Installation view. Acrylic paint on polyurethane foam and mixed media. Dimensions variable. This piece was the last major polyurethane installations they made, concluding a 20-year exploration. (Tate, 2006) Seen against the white walls of the gallery these materials are presented to the viewer as art, and the representation is a complex one. Their willingness to include any material shows a stance that appreciates the possibility of anything as art. This appreciation of perspective can be seen in ‘Sewer Workers’ (1987) which highlights workmen doing a job often ignored or otherwise dismissed. (Tate, 2006) This piece, showing the processing of waste, can be described as a self-portrait, of sorts. Fischli and Weiss do just that, they process the waste of daily life, through the lens of an artist and the presentation of an artwork. 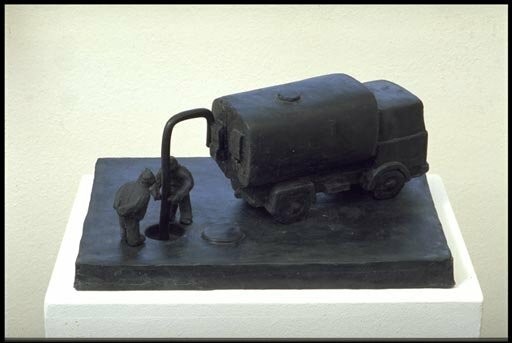 Using black rubber as a sculptural material for ‘Sewer Workers’ makes a scene that is familiar, although as stated often ignored, more jarring, the reality of the material, and its associatiobs, conflict with the banality of the subject. Though their portfolio is extensive and eclectic (to say the least) their visual language is an intelligent and humorous commentary on life, art and almost anything in between. Their work challenges notions of the everyday and people's perceptions of the world around them, which I think is a simple test for great art. Guggenheim (2016) Peter Fischli David Weiss: How to Work Better [Online] Available from: https://www.guggenheim.org/exhibition/peter-fischli-david-weiss-how-to-work-better [Accessed 15.11.17]. Matthew Marks Gallery (Undated) Peter Fischli David Weiss [Online] Available from: http://www.matthewmarks.com/new-york/artists/peter-fischli-david-weiss/ [Accessed 15.11.17]. Millar, J. (2012) Fischli and Weiss: the art of humour [Online] The Guardian. Available from: (https://www.theguardian.com/artanddesign/2012/jun/05/fischli-and-weiss-art-of-humour [Accessed 16.11.17]. Tate (2006) Fischli and Weiss: exhibition room guide, room 10 [Online] Available from: http://www.tate.org.uk/whats-on/tate-modern/exhibition/fischli-weiss/fischli-weiss-room-guide-room-1/fischli-weiss-6 [Accessed 15.11.17]. Tate (2006) Fischli and Weiss: exhibition room guide, room 1 [Online] Available from: http://www.tate.org.uk/whats-on/tate-modern/exhibition/fischli-weiss/fischli-weiss-room-guide-room-1 [Accessed 15.11.17]. Tate (2006) Fischli and Weiss Flowers and Questions. A Retrospective [Online] Available from: http://www.tate.org.uk/whats-on/tate-modern/exhibition/fischli-weiss [Accessed 15.11.17].